The power of consumers is directly driving the food industry to move away from highly processed foods with a longer shelf life, to temperature-sensitive perishable food products. This requires an adjustment in the food supply chain. In addition, when it comes to supermarket shopping, the rise of the millennial generation and their focus on online shopping means that the days of multiple driving trips to the supermarket per week may be a thing of the past. 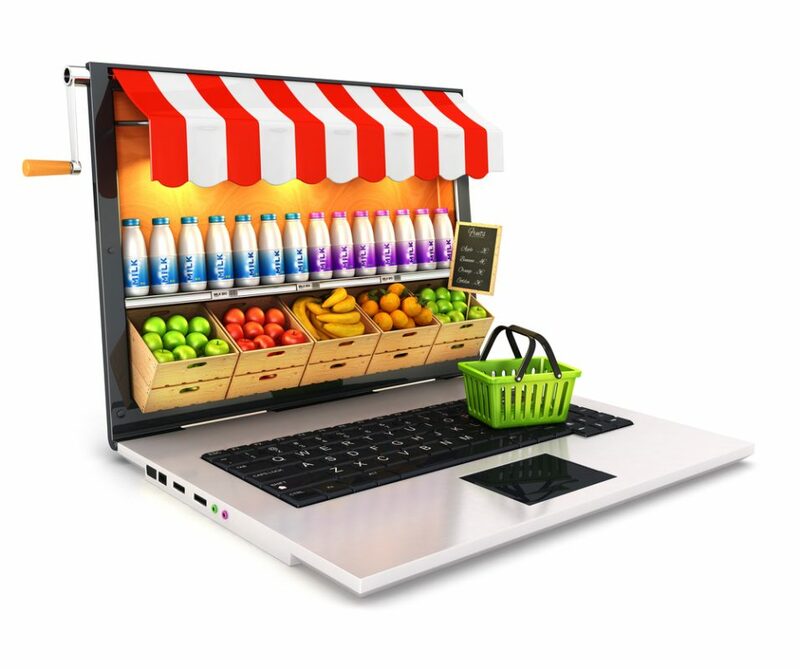 Even though it is estimated that over 95% of Americas drive to the supermarket each week, the remaining shoppers purchase their groceries online which translates to approximately 3% of total grocery sales as of 2017 or $19 billion. So, the question to ask is, what would happen to the cold storage warehouse industry if online grocery sales reach $100 billion or 13% of all grocery sales by 2025? According to the Global Cold Chain Alliance (GCCA), the average occupancy rate of a cold storage warehouse currently exceeds 85%. The industry considers this to be a full facility. As of 2017, there is 3.6 billion cubic feet of food commodity cold storage capacity within 180 million square feet of industrial space, mainly in refrigerated warehouses, as well as, 300 million square feet of space in grocery stores and other food related retail venues. A 10% expected growth of online grocery sales translates to an increase in demand for 35 million square feet of cold storage space over the next 7 years. This shift will positively impact the need for refrigerated and frozen warehouse space and negatively impact the retail footprint as less Americans visit supermarkets, especially millennials, over the next 10 years. To lower refrigerated warehouse costs and to increase time of delivery to consumers, many refrigerated warehouses are located near densely populated areas. The high cost of construction, increasing land prices, and the ongoing cost of operating a refrigerated warehouse are primary factors affecting new construction. As new cold storage warehouse facilities come online over the next 10 years, the industry builders will be focused on vertical development and use of automation to offset the previously mentioned cost factors. In planning and constructing an effective cold storage facility, cubic feet is more important that square footage. This means that new construction has a preferred ceiling height of between 36-40 feet, compared to the 22-foot average height for buildings over the last 20 years. Also, because heat infiltration is greatest through the floor and roof, taller buildings tend to have better energy efficiency than lower or wider buildings of similar volume. This is vital to budgeting as the power to cool inventory can be more than 25% of a building’s ongoing electric operating costs. Other factors involved in construction include insulation, freezer floor system, refrigeration equipment and back-up generators. As a result of these factors, the warehouses are often built around product flow and material storage. The design-build method of delivery is a popular choice for food facilities. 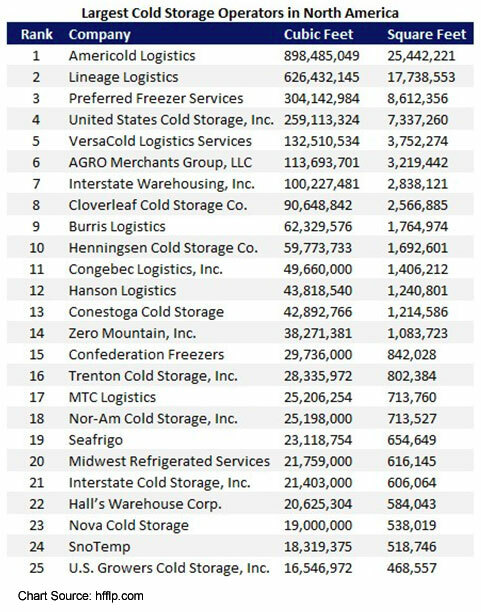 As of 2017, the top 10 cold storage, refrigerated warehouse companies own 80% of the market. This trend will continue as the larger companies merge or acquire smaller cold storage operations. A number of major food retailers do own their distribution and others, including manufacturers, often partner with 3PL companies to manage and operate warehouses. A number of food manufacturers are shifting from DSD to warehouse ownership to take advantage of economies of scale. All of these trends will continue to drive the cold storage refrigerated warehouse sector for years to come. Current demand for refrigerated storage is approximately 33% from food manufacturers, 33% from wholesalers, 22% from retailers and 12% by pharmaceutical. Focusing on food, these percentages are due to change as Amazon, Walmart, Target and other e-commerce companies offering perishable items look to bypass wholesalers to purchase goods directly from manufacturers all in an effort to reduce operating costs and anticipation of the coming increase in online grocery sales. The rise in online shopping and just-in-time delivery has also created increased opportunity at the U.S. ports. Distributors require additional space to accommodate spikes in SKUs and temperature control smart technology to handle a wider selection of inventory. Many U.S. ports are promoting the growth of large multi-temperature facilities that can supply smaller infill distribution centers that are located closer to consumers for fast last-mile grocery deliveries. 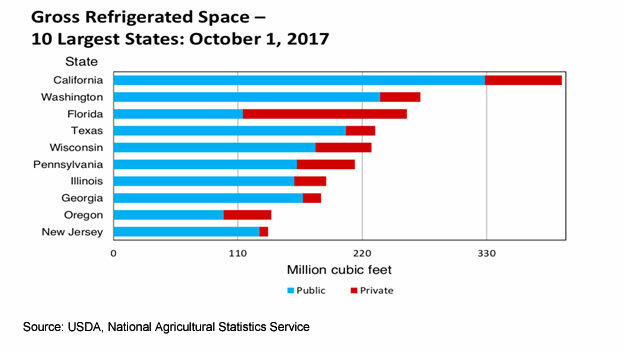 In the coming years, food-grade storage facilities will continue to be located in states with agricultural production, large populations or both. In terms of revenue, 3 of the top 5 agricultural products in NJ are dairy products, chicken eggs and blueberries. The top 3 field crops are soybeans, corn and wheat. New Jersey is also a major producer of asparagus, bell peppers, eggplant, endive, lettuce and spinach. In terms of manufacturing, food processing ranks 2nd and includes bakery products (fresh & frozen), beverages, fruits, meats, roasted coffee, sugar and vegetables. In terms of fishing, ocean products include blue crab, flounder, lobster, scallops, swordfish and whiting. The current estimated population of NJ is 9.03 million with a growth rate of 0.41%. This makes NJ the 11th most populous state in the U.S despite being ranked 47th in size. For every square mile of NJ territory, there is an average of 1,195 people. This makes the state the most densely populated state in the U.S. New Jersey is the only state to have every single county considered “urban” by the census bureau. Urban locations are a wise choice for those looking to invest in refrigerated warehouses as cities provide a strong distribution network and a large pool of consumers. For those of us in the NJ brokerage community always on the lookout for opportunities and how they will impact the CRE market, we should be developing and working with our clients as they set up regional supply chain networks and access regional transportation routes. Our role as brokers, should be to identify and present locations and temperature-controlled logistic warehouse options for wholesalers, manufacturers and investors. As e-commerce expands further into the grocery business, the growth of the food supply chain and demand for climate-controlled warehouse space will present new opportunities for investors, as well as developers. In recent years and with the rise in investor demand, spreads have compressed to 100 to 150 basis points between dry warehouse and cold storage. In certain cases, 75 basis points for Class A product located in gateway markets like New Jersey. This should and continue to be transformative in the years to come.